Get ready for an adventurous stay in the gorgeous valley of Nainital. You'll have comfortable Swiss tents to stay in, and a whole host of activities to enjoy during the day. Try out the swaying Burma Bridge, do some rock-climbing on a dwarf hill, rappel down a vertical drop, and fly across the hills on a zipline. In the evening, you'll gather around a campfire and spend quality time with your loved ones. 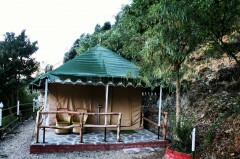 This camping adventure in Nainital is a perfect option for a family or for a group of friends looking for a fun getaway. 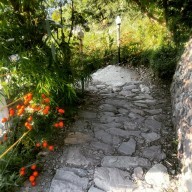 Set in the serene valleys of Nainital, your campsite is 15 kms from the town, in a peaceful village called Bagar Malla. With only 120 households, the locals are warm and friendly. Owing its proximity to the Pangot and Kilbury Bird Sanctuary, it is a haven for bird watchers. 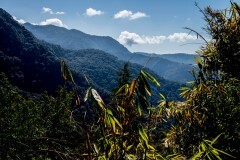 You will wake up to spectacular views of the lush green valley every morning. At night, the sky is studded with thousands of twinkling stars. 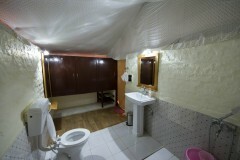 You will stay in luxurious Swiss tents that are equipped with an attached tiled bathroom with running hot water. Each tent is sealed to keep insects out, and has a double bed, wooden flooring, charging points, and a private seating deck outside the tent. You will enjoy an open-air dining area that serves organic, pure vegetarian meals, as well as all-day complimentary treats like soup, Maggi noodles, and hot tea or coffee. 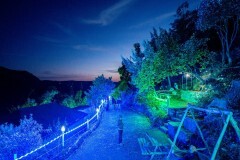 • Book a fun camping trip in Nainital. 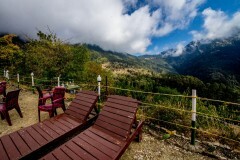 • Soak in the gorgeous vistas of the lush green valleys of Nainital. • Rappel down a vertical drop, cross the swinging Burma Bridge and fly across the hills on a zipline. 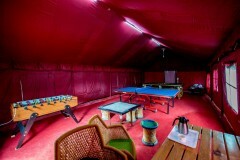 • Stay in spacious Swiss tents with a private seating area. • Spot many species of migratory Himalayan birds. 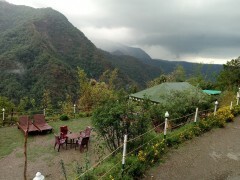 This camping trip in Nainital is not strenuous, but includes many adventure activities. If you have any cardiac or respiratory conditions, or have had surgery recently, it is advisable to check with your doctor before booking. Please avoid disturbing any of the other campers at the Nainital campsite. If you are found to be disruptive at camp, the operator will ask you to leave. There will be no refunds in this case. You cannot participate in any adventure activities if you are under the influence of drugs or alcohol. There will be no refunds in this case. Smoking and alcohol are permitted at camp, but not inside the tents. 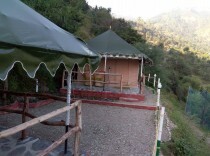 For cancellations made 24 hrs or more before the check-in to this Nainital campsite: Full refund will be given. For cancellations made 0-24 hrs before the check-in to this Nainital campsite: The operator reserves the right to charge a cancellation fee. The operator reserves the right to admission. The administration will not be responsible for any cancellation due to unforeseen weather conditions. You will be required to present valid photo IDs of all the adults staying in the campsite. The operator will not be responsible for any loss of belongings during the camping trip in Nainital. The operator will not be responsible for any injuries or mishaps during adventure activities. If the travellers damage or lose any of the property during their stay, they will be liable to pay for the same. There will be no refunds for any facilities/meals that the traveller does not use. Children in the age group of 5-12 years will be charged half of the tariff. Children above the age of 12 will be charged full tariff. You can check into the campsite at noon, and will be shown to your tents to freshen up. After a delicious lunch, you'll get ready for your day of adventure. You can choose to try the Burma Bridge, the zipline, the vertical drop rappelling, or you could just go for a walk in Nainital. After a fun day, you'll relax around the bonfire and then head for dinner. You'll stay in comfortable Swiss tents at night. 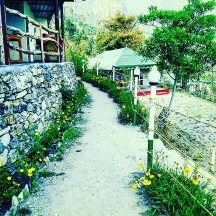 Check in to this beautiful Nainital campsite. Try to wake up early so you can sit out on your private sitting deck and watch morning dawn over the valley. You'll eat breakfast. By 11:00 hrs, it's time to check out. Your trip ends here. Enjoy a peaceful morning from your private sit-out. 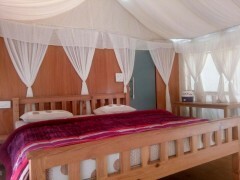 In-tent: Double beds, all bedding, private sit-out, wooden flooring, attached tiled bathrooms with running hot water. You'll check in to the campsite by noon, and will be shown to your tents. You'll be staying in twin-sharing Swiss tents with wooden flooring, attached tiled washrooms with running hot water, and a private sit-out. Lunch will be served in the pure veg restaurant on camp. You'll have unlimited tea, coffee, Maggi noodles, and veg soup during your stay at this restaurant. 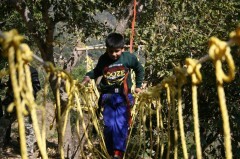 You can try your hand at the numerous adventure activities. Dinner will be served at night. Overnight in a cosy double bed. Check in to a comfortable spacious tent. You'll wake up to a misty morning, and can watch the sun rise from your private sit-out. After that, you'll eat a big breakfast. By 11:00 hrs, it's time to check out. Trip ends here. Eat a delicious breakfast at this open air dining area. 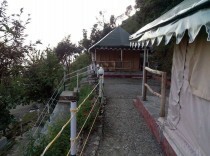 The campsite is located 15 kms from Nainital town, on Kilbury Road, near Pangot.